Most people come to Las Vegas to party. The rest of us actually need to live normal, healthy, productive lives. So, unless you’re moving to Vegas to work on the Strip, and you’d like to live close to where you work, you should probably look outside of the tourist areas for your next apartment. With beautiful, golf-course views and green trees everywhere, Crossing at Green Valley is a great complex. The floor plans range from 657 – 1,114 square feet and some units even include wood-burning fireplaces and full-size washers & dryers. There’s so much within walking distance of the property that you’ll be able to walk everywhere and get a little exercise while you run errands. Within half a mile of your apartment, you’ll have access to 7 restaurants, a Starbucks, a grocery store, 2 health clubs, a pharmacy, and an elementary school. Go just a little farther and you have parks, a post office, book stores, healthcare facilities, entertainment, bike shops, banks, and more. 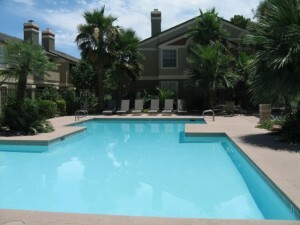 With a bright blue pool and Jacuzzi, the people at Crystal Creek are ready to show you around. These apartments are spacious and comfortable with floor plans ranging from 720 – 1,253 square feet for 1 – 3-bedroom units. In close proximity to Crossing at Green Valley, many of the same local amenities are available here. My favorite restaurants in the area include Port of Subs, China Garden, Fire it Up Gourmet Pizza, and KA Japanese Bistro. There’s a McDonald’s nearby, too, but I’m not a huge fan. Another great thing about the location of these two apartment complexes is that public transportation is available right around the corner. Help the environment and ride the bus to work in Las Vegas. Renting an apartment in one of these two complexes is a great idea. Schedule some time to go visit them in the next few days; you’ll be glad you did. How about you? Any luck finding apartments in Henderson? Comment below.